He Holds My Right Hand: "The Dragon and the Turtle" - Book Review and Contest Info. "The Dragon and the Turtle" - Book Review and Contest Info. 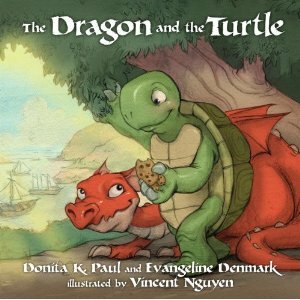 The Dragon and the Turtle, by Donita K. Paul and Evangeline Denmark, is a cutely illustrated, and uniquely descriptive picture book about Padraig the dragon and his new friend, Roger the turtle. I think most children in the age range of 4-10, would enjoy this book - although it seems my 8 year-old son enjoyed it more than his older sister, probably due to the fact that it includes 2 boys (one of them a dragon), and a pretend pirate adventure. For a brief synopsis, two completely different boys meet and become friends; Padraig realizes his new friend is lost and does everything he can to help Roger get back home; the boys use the senses of sight, sound, smell and taste to finally find the right house. Unlike other picture story books I’ve seen, this one has a couple of pages found after the story to help a parent or caregiver delve deeper into the meaning of the book. It offers a Bible verse (Proverbs 17:17,) as well as discussion questions regarding friendship. It even gives a recipe on the last page for Chocolate Chip Snappers, the special kind of cookies mentioned in the book. You can find this book on Amazon.com for under $10.00. And, for those who are interested, Waterbrook Multomah Press is now running a “Go On Safari” contest, based on The Dragon and the Turtle books. Children ages 2-10 may participate in the contest, but you need to hurry, as the contest ends on February 11, 2011. Two runner-up winners will receive a copy of The Dragon and the Turtle and The Dragon and the Turtle Go on Safari and a stuffed animal.